Dental crown or dental cap recommended? Do you need one? Tooth has cracked tooth syndrome – basically means it hurts when you bite on it wrong. May need to have a root canal as well. The day of the procedure you will get numb (not always needed on teeth with a previous root canal). The tooth will be shaped with a dental bur into a circular stump by reducing .5-2mm in every direction. All decay or existing unstable filling material will be removed. Some of the tooth may need to be built back up if too much of the tooth is missing. A flowable material will be used to take an impression or a camera looking device will take a digital impression. A milling machine in the office may make your crown while you wait or the impression will be sent to a lab to be made. Not all teeth can be made on site as the machines used in dental offices are not as strong or capable as the ones used in large dental laboratories. If made by a lab a temporay dental crown will be made and weakly cemented on. The final is step is fitting of the dental crown and cementing it on. Usually an x-ray will be taken to confirm proper fit. If you are getting a dental crown (dental cap) with today’s technology you have 1 of 3 options. The vast majority of crowns done in the U.S. used to be porcelain fused to metal, although with advances in materials more and more are all porcelain. We likely have already passed the point at which all porcelain crowns have passed porcelain fused to metal in the US. At our office we have moved on to doing a majority of the crowns in all ceramic; mostly with a material called lithium disilicate (e.max) OR yttrium-stabilized tetragonal zirconia polycrystal (Bruxzir). An example of how Dr. Bauer treats teeth jaw today is found in the photo below = Bruxzir crowns on the molars and emax crowns everywhere else. The farther back in your mouth a tooth is the more force that you put on that tooth and the stronger it needs to be. If you are a grinder or a clencher you will want a stronger crown. The main esthetic disadvantage of porcelain fused to metal crowns is the black or dark line that shows along the gum line as you get older and the gums recede a little. You can see this easily on crown #2 and just barely on crown #3 in the photos below. We can recommend a type of crown for you but what you want is very important to us. We will not let you make a choice that is contra-indicated and/or has a high chance of failing/breaking in your particular case. Below is a picture of three of the historically more popular options available (the older crowns are not all-ceramic). 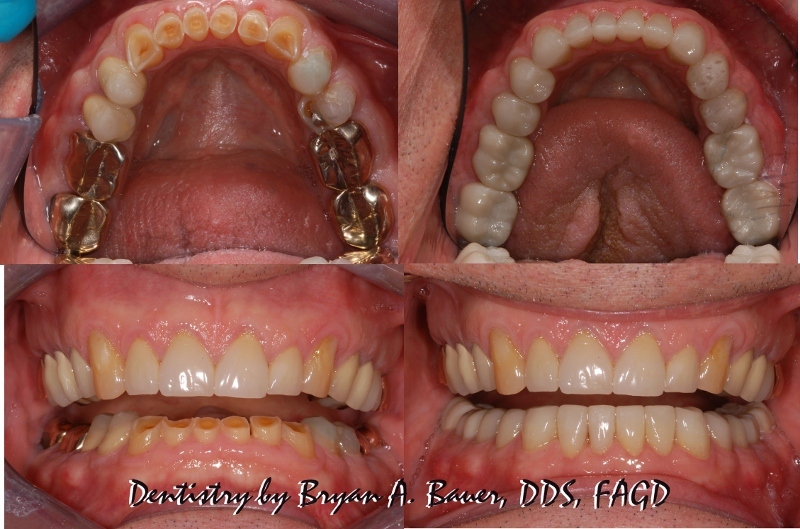 This dentistry was done by Dr. Dettmer (1-3) and Dr. Bauer (4) over a significant number of years. There are four crowns on these teeth. 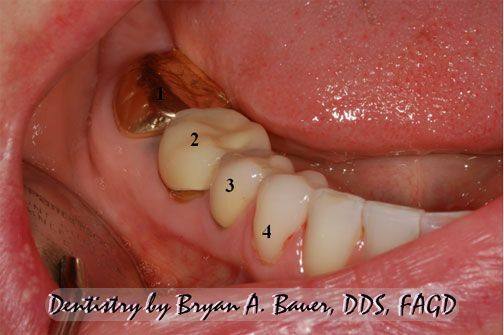 1 full gold crown 2 and 3 are porcelain fused to metal and 4 is all-ceramic dental crown (emax). We charge the same fee for all types of dental crowns, around $1350 in 2015. However, the final fee depends on the condition of the tooth. Things that influence the price of the dental crown are additional procedures that must be done. Those include things like a build up or post if the tooth is badly broken down or has had a root canal. Also a root canal is a separate fee as well. Some teeth are broken down so badly that they are below the bone level and to restore we must remove some bone. This procedure is called crown lengthening. If you need that you should be seriously considering a dental implant at that point though. Cost of the fees for your zip code can be found on this website. There may not be enough tooth left to save and the dentist may not know that until after we start the work. The tooth could end up hurting and needing a root canal after we work on it. This is because while the nerve could handle the trauma from the relatively slow growing cavity or crack approaching it, us removing all that decay and tooth structure at once is very traumatic to the tooth. The combination of the slow growing crack or decay and us drilling it all away can send a tooth that was borderline, over the edge and require a root canal. A tooth that is badly cracked may get a crown and root canal and still hurt and need to be extracted. This does not happen very often but a cracked tooth is very difficult to diagnosis accurately due to inconclusive information that the patient feels. The above link is research that answers that question. Insurance will pay for a new crown every 5 years, but the expected length is considerably longer. I replace any dental crown that doesn’t make it 5 years at no cost, as it rarely ever happens. Personally, I want a dental crown to last at least 20 years and kind of expect that most will be there when the person passes away or the tooth is lost due to other reasons.